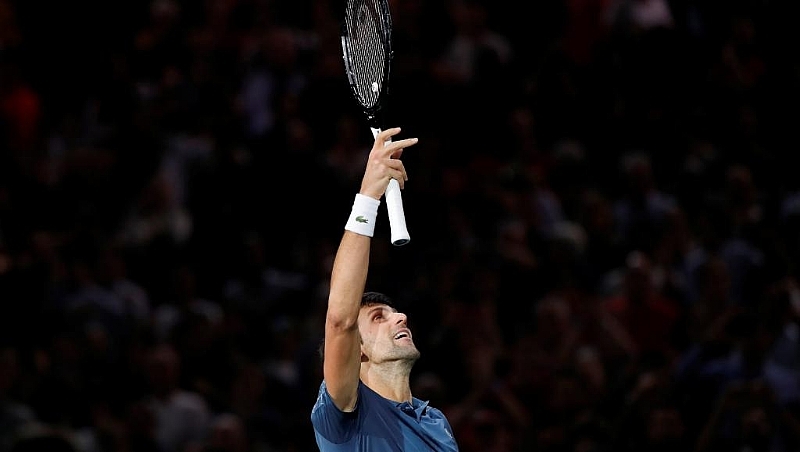 Novak Djokovic advanced to the final of the Rolex Paris Masters after an intense three hour duel on Saturday night with Roger Federer. The Serb claimed his place in Sunday's final 7-6, 5-7, 7-6. He will play the unseeded Russian Karen Kachanov who destroyed the fifth seed Dominic Thiem 6-4, 6-1 to reach his first championship match at a Masters series. The events are considered as the most prestigious on the circuit after the Grand Slam tournaments. Djokovic who has claimed 33 of them, is the only player to have won Masters crowns at all nine venues. Federer has 26 Masters trophies. Success on Sunday for the Swiss would have been his 100th tour title. But he was denied the chance to compete for his century by a Djokovic who underlined his credentials as world number one with a performance of consistency and nerve. After edging Federer in the opening set tiebreak, he lost his service for the only time in the match when trying to take the second set into a tiebreak. In the decider, he squandered two break points on Federer's opening service game and two more when the third seed was attempting to take a 5-4 lead. Djokovic maintained his composure while twice serving to stay in the match. After the tension of the previous hours, the final set shootout was flaccid. After Federer opened his account with a forehand winner, Djokovic swept up the next six points. He eventually took the tiebreak seven points to three to register his 25th win in their 47th encounter. The 14,000 fans packed stadium at the AccorHotels Arena in Bercy were treated to scintillating shotmaking and sly angles from men who have collected all of the game's leading prizes.